As he paddled a turbulent section of the Chattooga River between South Carolina and Georgia, Orlando Carrillo couldn’t help but take an engineer’s interest in the various rock formations and the patterns of rushing water circumnavigating them. The Piedmont Technical College (PTC) alumnus presents anything but the science nerd persona one might expect. He has played soccer all his life and enjoys rugged outdoor sports that include skydiving and ― yes ― whitewater rafting. Even before he earned his associate in mechanical engineering technology, Carrillo was employed as an engineering technician at MEC (Mayville Engineering Company) in Greenwood, an employee-owned metal fabricating enterprise founded in Wisconsin with locations in multiple states. He went on to earn a bachelor’s degree through PTC’s Bridge Program with South Carolina State University (SC State). He’s now been with MEC for four years, during which time he was promoted to manufacturing engineer. The SC State Bridge Program enabled Carrillo to “transfer” to SC State without having to commute to Orangeburg. Instead, through an articulation agreement with PTC, he was able to stay in Greenwood and complete courses toward a SC State bachelor’s in mechanical engineering technology on the Greenwood campus. 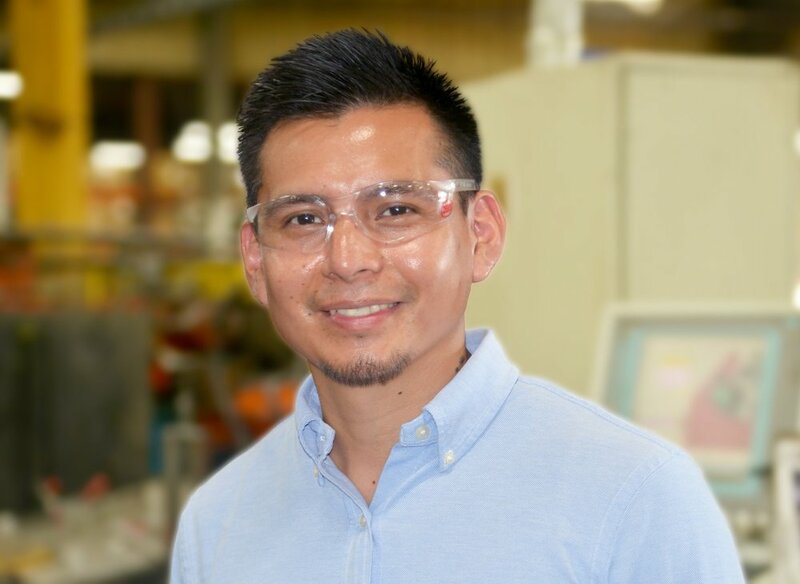 Carrillo’s relationship with PTC began at the college’s Center for Advanced Manufacturing (CAM) in Laurens, where he was taking basic classes to learn machine programming. While there, professors encouraged him to consider the mechanical engineering technology program. After receiving his computer programming certification, he enrolled in the engineering technology program. During that time, several PTC instructors left a lasting impression. Another instructor took his students on multiple field trips to local area manufacturing facilities, including Eaton and Prysmian. “What was memorable to me was to see how engineering could be applied in the field,” Carrillo said. Meanwhile, Carrillo is making an impression at MEC, a company that has provided him opportunity and valuable, constructive experience. One occasion that truly conveyed the company’s customer commitment and inclusive work culture came as Carrillo’s team was preparing for an important customer launch. One of the company’s top corporate officials traveled from Wisconsin to South Carolina every week for more than six months, going home only on weekends. Officials from SC State University and Piedmont Technical College gather in Greenwood for the signing of the articulation agreement on May 1, 2018.